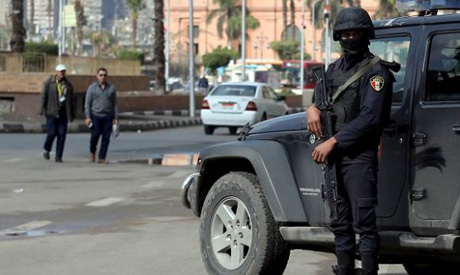 Egypt's army, backed by the police, is beefing up security nationwide ahead of the eighth anniversary of the 25 January uprising that overthrew longtime ruler Hosni Mubarak. Field armies and military forces will be deployed to secure vital sites and major roads and thoroughfares, the army said in a statement on Wednesday. There are no official celebrations to mark the 18-day revolt of 2011, which ended Mubarak's 30-year reign. Instead, the focus has so far been on celebrating Police Day, which – before the uprising – had long been celebrated on 25 January to commemorate the police's role in protecting Egyptians under the British occupation. Troops and police will be sent out on patrols "to deal with any attempt to break the law," the army said. Security will be tightened along the Suez Canal, a major global shipping route, and near the country's borders to forestall infiltration or smuggling attempts. "Combat groups" will be on the streets along with rapid response units to counter any possible "various hostilities," the statement added. Egyptian President Abdel Fattah El-Sisi attended earlier on Wednesday a ceremony at a Cairo police academy marking Police Day, and television channels have been airing reports and on police heroism.